Kudos goes to Mayor Kriseman for stepping up and taking action on a serious St. Pete issue. Sunday Mayor Rick Kriseman did the right thing and pledged 1 million dollars in immediate aid to St. Pete’s south side. Kudos go to Mayor Kriseman for stepping up and taking some immediate action on a serious St. Pete issue. Kriseman plans to focus his latest spending on creating opportunities, including improving education, skills training and job placement. Kriseman also wants to focus efforts on what he calls a “catalyst for commerce” by increasing job recruitment and business retention. He wants to increase efforts to boost cultural, arts and improve neighborhoods. There are some questions and some serious concerns. First, was City Council aware of the Mayor’s plan before the announcement or was this another Kriseman “surprise." Given the serious nature of the problems the Mayor is trying to address the whole chicken and egg question should not be a big issue, but some, ala Jim Kennedy may be a bit miffed. A second and much more serious issue is how all this money will be managed. I can imagine even as I am writing this the line is forming outside City Hall with all the usual suspects who like to get their hands in a City pie. With Kriseman throwing in arts and culture, he just made the line longer. There is a real opportunity to do some good with the Mayor’s initiative if it is well managed and focused. Giving money to the same organizations that have been running programs that feather their nest and do not work would be a big mistake. The last thing we need is this money being used to buy cars, office space, trips and consultants. City council should hold this one close to the vest; maybe even manage these programs in house through the Deputy Mayor’s office. It would be better to add a little internal administrative overhead than have this thing blow up in a scandal. It might be better if the task force were more advisory than managerial. 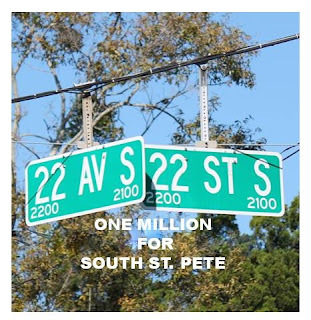 I believe everyone in St. Pete would be in favor of spending the Million and probably a lot more in south St. Pete if we could get a structure that could actually deliver results. This is not a onetime effort. Even if it is applied absolutely perfectly, one million dollars will barely scratch the surface. This effort needs to be a City budget line item that should increase by at least 25% for the next five years. Even that may not be enough. If you think I am going overboard, I encourage you to get in your car and drive through south St. Pete. E-mail Doc at mail to:dr.gwebb@yahoo.com or send me a Facebook (Gene Webb) Friend request. Please comment below, and be sure to share on Facebook. Will the PSTA Board Continue its wayward Path? Buckhorn on the Rays crazy or sly like a fox? Rays deal done – now what?